If grown right, green beans can be just as much of a home-grown treat as sweet corn. Green beans are, well, a snap to grow in Iowa. The single most important trick to growing truly mouth-watering green beans (yes, there is such a thing) is to harvest them often and small. Go out there every other day or so and pick the beans when they're no bigger than a cigarette. They'll be small and tender but also have an incredible flavor. I like to simply boil them (not too long!) and then add a little real butter and a dusting of kosher salt. Here's how to grow and harvest truly amazing green beans. • Key to delicious green beans is the type you choose to grow. 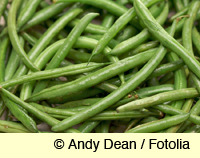 Always go with stringless green beans—no unpleasant fibrous string growing along the beans' "underbelly." • One of my absolute favorites for Iowa is 'Blue Lake'. This is available both in a pole bean variety and as a low-growing bush type. The pole type bears a week or two later, but takes up very little square footage. It's available only through Renee's Garden mail order, but it's worth the effort. Interesting broad bean shape, Incredible meaty texture, and deep bean flavor. It's so good that my neighbors, who get harvesting rights on my garden, rave about it. Who raves about green beans? • The tiny little "filet" beans are delicious, but this type of bean demands that you pick them just about every single day or they get large, tough, and not worth the effort. So plant them only if you're prepared to be relentless in harvesting. • Get creative on where you grow pole beans. I grow them on my kids' play structure, but you can also grow them on 8-foot teepees or along a fence. • How much green beans to grow? I usually grow 10 to 12 pole plants, enough to provide plenty of green beans for the dinner table for my family of about four from July through September. • Plant the seeds directly in the soil two weeks after your region's last frost date (they need well-warmed soil). That means planting them the last week of May in southern Iowa and the first week of June in northern Iowa. • When the green beans germinate and shoot up out of the ground, thin (that is, pull out the extra plants) to the spacing specified on the seed packet. • Harvest often, and enjoy!